Wounded in the shoulder & lung at the Dardanelles in August 1915. Buried at sea. Lone Pine Memorial, Lone Pine Cemetery, Anzac, Turkey. Memorial stone at Church of the Holy Innocents, Mount Peel. Donald Alfred RAE was born on 30 June 1892 at Peel Forest, a son of James and Eliza (nee GRIFFIN) RAE, of Peel Forest, Canterbury. Donald worked on Mesopotamia Station. Like his Scottish forefathers, he was of good shepherd stock. 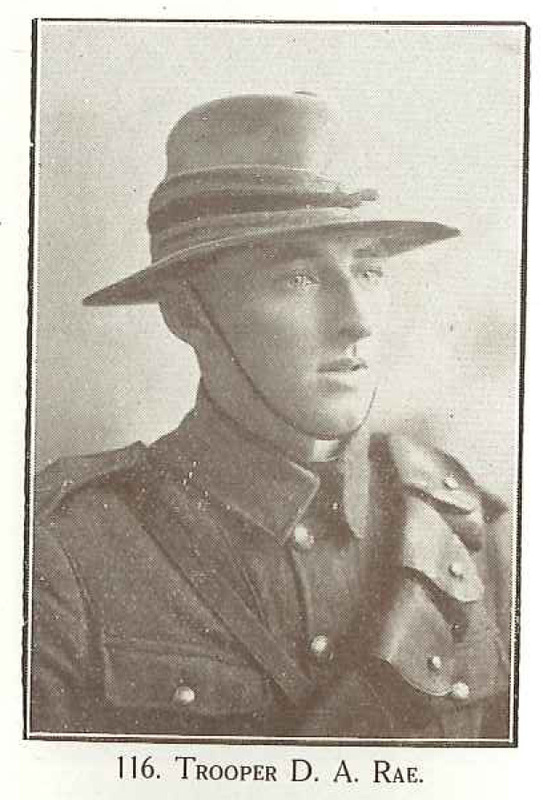 When he went away to serve his country, a fit young man just 22 years old, he disembarked in Suez on 27 March 1915; landed at Gallipoli on 1 May 1915. on 23 August 1915 he was posted to the 8th Squadron, Canterbury Mounted Rifles. Five days later he had died of wounds. His brother William John (John) RAE was killed in action on 7 May 1917. Seven RAE nephews from one family served in WWII. Donald's father, James RAE, died in November 1915, after which his mother, Eliza, became his next-of-kin and the one to whom his medals, plaque and scroll would be sent. In his short will drafted at the time of enlisting, Donald entrusted his affairs to an older brother, James Martin RAE, and instructed that the residue of his estate be divided between his parents. In addition to local memorials which recognise his roots and upbringing, Donald is remembered on the Ashburton War Memorial and the Lowclffe Memorial, marking the place where he was working, quite possibly like several others on the Lowcliffe Estate.